This past year was another big year for the vodka category. Not only were total volumes of vodka up, but so were the number of offerings in the space. Much of the vodka expansion has been a result of renewed interest in flavored vodka, with cake, caramel, and other confection flavorings leading the charge. The overall growth can also be attributed to an expansion of spirits that are labeled “vodka” but don’t necessarily conform to the TTB’s definition of vodka. The definition of vodka by the TTB is a spirit “without distinctive character, aroma, taste, or color and containing, when bottled, less than four grams of natural flavor components consisting of esters, acids, and higher alcohols per 100 liters at 100° proof, and bottled at not less than 80° proof,” which dates all the way back to 1968 and has seen little revision or redefinition since then. Jack Daniels’ recent Unaged Rye is a perfect example of the TTB mislabeling something as a ‘neutral spirit’ or vodka when it clearly has distinct character and flavor. Karlsson’s Gold Vodka is another example of a spirit with clear character and flavor (it tastes like chocolate and black pepper) and yet it’s still considered a vodka. The clearly outdated definition of vodka by the TTB isn’t necessarily a bad thing, as it’s made room for some interesting releases which probably would have gotten lost in liquor stores filed awkwardly as “other.” Anchor Distilling’s Hophead Vodka is another example of a spirit which clearly doesn’t meet the TTB’s neutral spirit definition, but manages to be labeled a vodka. Hops are not a new element in spirits, they’ve been a part of some of our favorite offerings, including Charbay’s Double and Twisted White Whiskey and Schramm’s Canadian Gin. Hops are also a frequently used ingredient in beer. The problem with hops is that they are a rather volatile botanical with the capability of being extremely bitter and harsh. Distilling hops only compounds the volatility. Anchor Distilling, sister company to the legendary Anchor Brewing, has some pretty extensive experience dealing with hops in beer, and so they’ve brought this experience over to produce one of the first hops vodkas on the market. 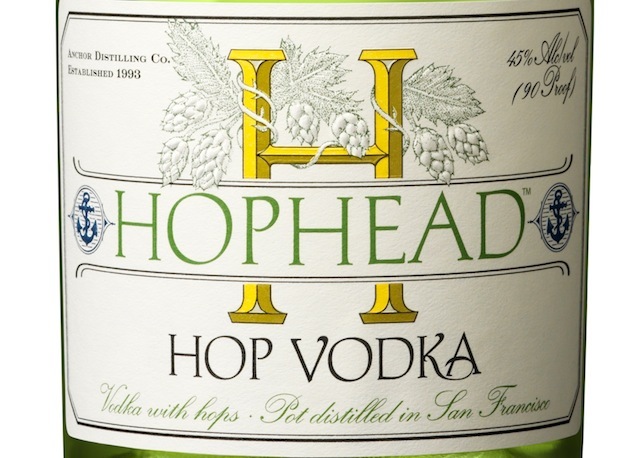 Hophead Vodka (90 Proof / 45% ABV, $29.95) is not a flavored vodka – it gets its hops flavor and aroma from hops which are macerated in neutral grain spirits before being distilled, in very much the same way as you’d make a gin. In addition to being a volatile botanical, hops can be quite complex, delivering a wide range of aromas from floral to spicy and sometimes a little funky. In the nose of the Hophead, the hops read on the floral side, and unfortunately quite soapy. There’s also a bitter core to the hops on the nose which combines with the floral notes in a less than inviting way. The entry is fairly bitter and reads fairly close to the nose with a soapy floral top note. The spirit begins to develop a nice complexity towards the midpalate as it takes on a hop funk undertone which reminds us of its cousin cannabis (they are both part of the Cannabaceae genius of plants) when it’s soaked in alcohol. At the end of the midpalate, Hophead takes an immediate left turn and drops many of the flavor notes in favor of a fairly conventional vodka note. The funky hop undertone does persist, and helps support the finish which is decidedly vodka-like. For a moment, in the midpalate, the Hophead Vodka shows the potential for distilling hops and the complexity that it can bring to the table. But as a whole, Hophead Vodka is a mess. The nose is uninviting and the spirit never comes together with any cohesion. Anchor Distilling was on the right path experimenting with hops, but they would have done much better doing a hop-centric gin or following in Charbay’s footsteps with a hopped white whiskey, or even better, use the Anchor Steam Beer base to do a true beer schnapps. Trying to take something as strong and volatile as hops and making it conform with a category defined by its neutrality just doesn’t make sense, and unfortunately neither does this vodka.